Definition at line 136 of file OptimizationRemarkEmitter.h. 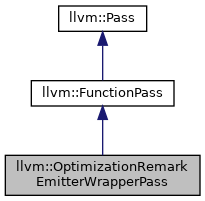 Definition at line 86 of file OptimizationRemarkEmitter.cpp. 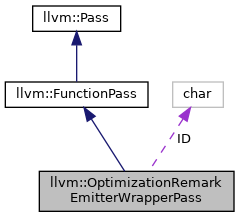 Definition at line 104 of file OptimizationRemarkEmitter.cpp. Definition at line 146 of file OptimizationRemarkEmitter.h. Definition at line 92 of file OptimizationRemarkEmitter.cpp. References llvm::AMDGPUISD::BFI, llvm::Function::getContext(), and llvm::LLVMContext::getDiagnosticsHotnessRequested(). Definition at line 151 of file OptimizationRemarkEmitter.h.